The six officials who issued these warnings were Charles Nemfakos, deputy under secretary of the Navy; Tommy Franks, head of the U.S. Central Command; John O'Neill, head of security at the World Trade Center who had previously been a senior FBI agent; Richard Clarke, the White House counterterrorism chief; Kirk Lippold, commander of the USS Cole when it was attacked by terrorists in October 2000; and Donald Rumsfeld, the secretary of defense. The accuracy of these men's warnings and the fact that the warnings were given so soon before 9/11 certainly appears suspicious. We need to consider, therefore, if the content and timing of the warnings, in relation to the 9/11 attacks, was just a coincidence or the result of something more sinister. Were the men who gave the warnings perhaps just very perceptive? Or did at least some of them know that a major attack was about to take place? If any of these officials knew in advance that a terrorist attack was going to take place in the U.S. on September 11, the imminent catastrophe would surely have been on their minds in the days leading up to it. They may therefore have been inclined to--perhaps inadvertently--make indirect references to what they knew was about to happen and this could be why they gave warnings that appear to have been prescient of the 9/11 attacks. On September 10, 2001, Nemfakos--the "number three official in the Navy," according to Defense Week magazine--gave a briefing to a group of civilian employees of the Naval Surface Warfare Center (NSWC) in Crane, Indiana. The NSWC employees had come to Washington, DC, to interact with some of the Navy's top officials and complete a program for a certificate in public management. Interestingly, in the 12 months before September 11, Nemfakos attended some "high-powered war games" that took place at the World Trade Center and seem to have helped prepare the American financial and national security communities for the aftermath of the 9/11 attacks. The war games were part of an initiative called the "New Rule Sets Project." The New Rule Sets Project was a research partnership between Wall Street bond firm Cantor Fitzgerald and the Naval War College in Newport, Rhode Island. It brought together "divergent groups of experts" in order to "assess global issues that will affect U.S. national security in coming decades," Defense News reported. Thomas Barnett, the project's director, said it "explored the future of globalization and what could threaten globalization, and what would be new definitions of international instability and crisis." Three days before Charles Nemfakos talked about the need for "an event equivalent to Pearl Harbor," Army General Tommy Franks, commander in chief of the U.S. Central Command (CENTCOM), made equally prophetic remarks. Specifically, he said his biggest fear was that there would be a terrorist attack against the World Trade Center. On September 7, 2001, Franks talked to his intelligence staff at CENTCOM headquarters in Tampa, Florida, about what he considered to be the major threats facing America throughout the Middle East and Central Asia. After he finished his presentation, a young sergeant asked him, "General, what keeps you up at night?" One man, John O'Neill, gave two separate warnings on the day before 9/11 that were chillingly prophetic of what happened on September 11. O'Neill again expressed his fear of an imminent al-Qaeda attack that evening, when he went out with a couple of his friends: Robert Tucker, a security company executive, and Jerome Hauer, the former director of New York's Office of Emergency Management. Strangely, despite his apparent concern about al-Qaeda carrying out an attack in the United States, O'Neill told Congressional staffers there was no threat to aviation. Cathal Flynn recalled that at some unstated time between 1993 and 2000, when he was head of security for the Federal Aviation Administration (FAA), the Senate Intelligence Committee asked the FAA, the FBI, and the director of central intelligence about threats to civil aviation. O'Neill went to the Hart Senate Office Building in Washington, DC, to respond on behalf of the FBI. But when Senate Intelligence Committee staffers asked, "What are the threats to aviation?" according to Flynn, "John O'Neill said there are none." On September 4, 2001, the National Security Council's principals committee--a group of senior officials who advise the president on issues of national security policy--met to discuss al-Qaeda. That day, before the meeting took place, Clarke sent Rice a memo in which he expressed his frustrations with U.S. counterterrorism efforts. A week after Clarke's memo was sent, a "big attack, with lots of casualties," did indeed occur and this was followed by "major U.S. retaliation," in the form of the invasion of Afghanistan in October 2001. Clarke had issued warnings on previous occasions, which, like the warning he gave in his memo to Rice on September 4, seem to have been prescient of the 9/11 attacks. He gave one such warning on July 5, 2001, during a meeting at the White House. At the meeting, which was attended by officials from a dozen government agencies, including the FAA, the FBI, and the Secret Service, a senior CIA counterterrorism expert said the CIA believed that al-Qaeda was planning "something spectacular," which would probably take place in Israel or Saudi Arabia. A number of steps that agencies should take to address the threat posed by al-Qaeda were agreed upon at the meeting. An e-mail Clarke sent to Rice the day after the meeting stated that several agencies, including the FBI, the CIA, and the Department of Defense, had been directed to develop "detailed response plans in the event of three to five simultaneous attacks." This was presumably quite fortuitous, since, just over two months later--on September 11--these agencies had to respond to four near-simultaneous attacks. On the morning of September 11, Lippold went to CIA headquarters in Langley, Virginia, to meet Charles Allen, the CIA's assistant director for collection; John Russack, Allen's deputy; and Donald Kerr, the CIA's deputy director for science and technology. During the meeting, Allen briefed Lippold on what the CIA knew about bin Laden and al-Qaeda. As the meeting was coming to an end, at around 8:30 a.m., Lippold said to Allen: "It means an awful lot for me to understand what our country is doing to try to catch [bin Laden]. But I don't think America understands." According to his own recollections, Lippold then said, "I believe it is going to take a seminal event, probably in this country, where hundreds, if not thousands, are going to have to die, before Americans realize that we're at war with this guy." Lippold and Russack left Allen's office and went to talk to some of Russack's colleagues. The two men noticed the coverage of the first crash at the World Trade Center--which happened at 8:46 a.m.--on a television at CIA headquarters and, at 9:03 a.m., saw the second hijacked plane crashing into the World Trade Center as it happened. Secretary of Defense Donald Rumsfeld, like Lippold, warned about the possibility of a catastrophic event taking place minutes before the first hijacked plane crashed into the World Trade Center. He said a surprise event--such as a terrorist attack--would occur in the near future. Representative Christopher Cox recalled that Rumsfeld said at the meeting that the United States needed to "focus on the real threat facing us in the 21st century: terrorism, and the unexpected." He said Congress had to give the president "the tools he needs to move forward with a defense of America against ballistic missiles--the ultimate terrorist weapons." If any of these men knew beforehand what was going to happen on September 11, we need to discover how they came across this information. Furthermore, if any of them had foreknowledge of 9/11, we need to find out why the attacks on the World Trade Center and the Pentagon weren't prevented. Could these powerful officials have used their influence to stop the attacks? If they could have but didn't, why was this? The fact that 14 years after the event, key questions--such as those regarding the possibility of senior U.S. officials having foreknowledge of the attacks--remain unaddressed, shows why it is so important that we have a new investigation of 9/11. Chris Pruett, "Eric Moody Recalls His 'Escape From the Pentagon.'" Greene County Daily World, September 14, 2001; Susan Williams, "'Come to My Voice and Keep Your Arm Against the Wall.'" IU Home Pages, September 14, 2001; Dave Taylor, "Forever Changed: ISU Alumnus Experienced First-Hand the Terrorist Attack on the Pentagon." Campus Connection, September 25, 2002. "Christopher Dodd Discusses the Terrorist Attack." Breaking News, CNN, September 11, 2001; Steven Mufson, "Attacks Were an Act of War--But Who's the Enemy?" Washington Post, September 11, 2001; Joseph Fitchett, "Like the Attack in 1941, Air Terrorism Could Provoke Severe Repercussions: For Washington, a Modern Pearl Harbor." New York Times, September 12, 2001; David E. Rosenbaum, "Years of Unheeded Alarms." New York Times, September 12, 2001. 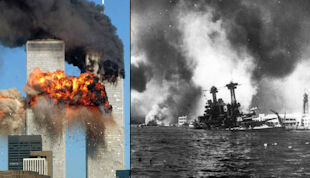 Annie Nakao and Carol Ness, "A Different Day of Infamy: Comparisons to Pearl Harbor Recall Another Time and Place." San Francisco Chronicle, September 14, 2001. David M. Kennedy, "Fighting an Elusive Enemy." New York Times, September 16, 2001; Chris Mautner, "Remembering Pearl Harbor: A Reader's Guide." PennLive.com, December 7, 2010. Brad Plumer, "Nine Facts About Terrorism in the United States Since 9/11." Washington Post, September 11, 2013. John M. Donnelly, "Top Navy Execs Tried to Bilk Retirement System." Defense Week, August 19, 2002. Thomas P. M. Barnett, The Pentagon's New Map: War and Peace in the Twenty-First Century. New York: G. P. Putnam's Sons, 2004, pp. 5, 46. Robert Holzer, "Divergent Groups View U.S. Security in New Way: Unique Exercise Assesses Impact of Global Issues." Defense News, December 4, 2000. "The Pentagon's New Map: War and Peace in the Twenty-First Century." Booknotes, C-SPAN, May 30, 2004; "NewRuleSets.Project: Project History." Thomas P. M. Barnett, July 3, 2004; "Senior Strategic Researcher and Professor at the U.S. Naval War College to Speak at WWS, November 4th." Woodrow Wilson School of Public and International Affairs, November 4, 2004. Thomas P. M. Barnett et al., Foreign Direct Investment: Decision Event Report II of the NewRuleSets.Project. Newport, RI: Naval War College, Center for Naval Warfare Studies, Decision Strategies Department, 2001; "Asian Environmental Solutions: Decision Event Read-Ahead." Thomas P. M. Barnett, November 30, 2004; Thomas P. M. Barnett, interview by Harry Kreisler, Institute of International Studies, March 8, 2005. "The Pentagon's New Map: War and Peace in the Twenty-First Century." Thomas P. M. Barnett, The Pentagon's New Map, pp. 5-6. Dan Verton, "Former CENTCOM Commander Advises IT Sector on Leadership." Computerworld, October 21, 2003; Tommy Franks and Malcolm McConnell, American Soldier. New York: HarperCollins, 2004, p. 236. Scott Taylor, "My Country, Right or Right." Globe and Mail, October 9, 2004. Bill Gertz and Rowan Scarborough, "Inside the Ring." Washington Times, June 22, 2001. "Bush's War Room: Gen. Tommy Franks." ABC News, January 7, 2006. Anwar Iqbal, "U.S. General: CIA Chose Karzai." UPI, August 17, 2004. David Johnston and James Risen, "FBI is Investigating a Senior Counterterrorism Agent." New York Times, August 19, 2001; "WTC Tragedy Took Away Security's Finest." Access Control & Security Systems, October 1, 2001; Lawrence Wright, "The Counter-Terrorist." New Yorker, January 14, 2002; "Staging Area Facility at Ramstein Air Base to be Dedicated to the Memory of John P. O'Neill." Federal Bureau of Investigation, September 11, 2006. Murray Weiss, The Man Who Warned America: The Life and Death of John O'Neill, the FBI's Embattled Counterterror Warrior. New York: Regan Books, 2003, pp. 355, 359-360; Murray Weiss, "Flashy Fed Foresaw Bin Laden's Terror." New York Post, August 10, 2003. Lawrence Wright, "The Counter-Terrorist"; "The Man Who Knew." Frontline, PBS, October 3, 2002; Murray Weiss, The Man Who Warned America, p. 362. "Memorandum for the Record: Interview With Rear Admiral Cathal 'Irish' Flynn, USN (Ret.)." 9/11 Commission, September 9, 2003; "National Commission on Terrorist Attacks Upon the United States: Public Hearing." 9/11 Commission, January 27, 2004. "Memorandum for the Record: Interview With Bruce Butterworth, Former Director for Policy and Planning (ACS-1) at the FAA." 9/11 Commission, September 29, 2003. 9/11 Commission, The 9/11 Commission Report: Final Report of the National Commission on Terrorist Attacks Upon the United States. New York: W. W. Norton & Company, 2004, pp. 212-213; "National Policy Coordination: Staff Statement No. 8." 9/11 Commission, March 24, 2004. Barton Gellman, "Before Sept. 11, Unshared Clues and Unshaped Policy." Washington Post, May 17, 2002; Michael Elliott, "They Had a Plan." Time, August 12, 2002; Richard A. Clarke, Against All Enemies: Inside America's War on Terror. New York: Free Press, 2004, p. 236. David Johnston and Eric Schmitt, "Uneven Response Seen on Terror in Summer of 2001." New York Times, April 4, 2004. 9/11 Commission, The 9/11 Commission Report, p. 190; "USS Cole Bombing." GlobalSecurity.org, October 11, 2006; Bruce Tomaso, "A Q&A With Kirk Lippold, Commander of the USS Cole." Dallas Morning News, June 6, 2012; "The USS Cole Bombing." Federal Bureau of Investigation, n.d.
 George Tenet and Bill Harlow, At the Center of the Storm: My Years at the CIA. New York: HarperCollins, 2007, pp. 162-163; Kirk S. Lippold, Front Burner: Al-Qaeda's Attack on the USS Cole. Philadelphia, PA: PublicAffairs, 2012, pp. xxii-xxvi; "Q&A With Kirk Lippold." Q&A, C-SPAN, June 13, 2012. "SecDef Breakfast With House Supporters." U.S. Department of Defense, September 10, 2001; Robert Burns, "Pentagon Attack Came Minutes After Rumsfeld Predicted: 'There Will be Another Event.'" Associated Press, September 11, 2001; Powell A. Moore to Donald Rumsfeld, memorandum, September 19, 2003. Donna Miles, "Vice Chairman: 9/11 Underscored Importance of DoD Transformation." American Forces Press Service, September 8, 2006. Christopher Cox, "Chairman Cox's Statement on the Terrorist Attack on America." U.S. House of Representatives, September 11, 2001. "Interview With Donald Rumsfeld." Larry King Live, CNN, December 5, 2001. Christopher Cox, "Chairman Cox's Statement on the Terrorist Attack on America." "National Commission on Terrorist Attacks Upon the United States: Eighth Public Hearing." 9/11 Commission, March 23, 2004; Donald Rumsfeld, Known and Unknown: A Memoir. New York: Sentinel, 2011, pp. 334-335. "Secretary of Defense Donald Rumsfeld's Remarks at Pentagon's Riverfront Entrance." U.S. Department of Defense, September 10, 2004. Joe on Fri, 07/17/2015 - 3:49pm. Shoestring on Sat, 07/18/2015 - 4:05am. According to Bob Woodward in his book “State of Denial”, Rumsfeld was told by George Tenet on July 17, 2001 of a huge al Qaeda terrorist attack aimed at the US that would cause mass US casualties. Aviation Week, the last week of August 2001 issue, had an article on Rumsfeld where he stated that that the US government had been getting numerous warning since April 2001 of a huge al Qaeda terrorist attack inside of the US. rschop on Fri, 09/11/2015 - 10:11pm.